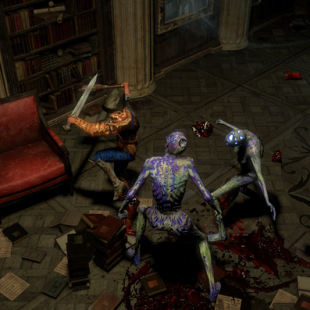 Lead developer Chris Wilson hopes to expand Path of Exile with new localizations in 2014. In case you haven't heard of Path of Exile, you can pretty much sum it up as a free-to-play Diablo II with addictive gameplay, an insanely deep skill tree and production values that belie the fact that it was made by a small team of indie developers. If that sounds appealing to you, take comfort in the fact that you're far from alone. The game has garnered some considerable critical acclaim since its launch and has quickly been amassing a user base that many games in the free-to-play market would kill for. That in mind, lead developer Chris Wilson recently spent some time boasting about all that the game has accomplished since it launched out of beta this past October. Most notably, Wilson revealed that Exile entered 2014 with a whopping 3.7 million registered player accounts. These accounts aren't just being ignored either. Wilson reported that before the end of 2013 the game hit a peak of nearly 70,000 people playing simultaneously, a number he "[expects] to beat" as he and his team "localize the game to more countries" in 2014. To help facilitate this planned growth, Grinding Gear Games has added new staff and already has a fresh patch planned for January 9th. Here's hoping that that will just be start of a busy and successful new year for a game that looks to be in possession of some honest-to-goodness potential for greatness.